ATLANTA — Analyzing Alabama’s dramatic 26-23 overtime win over Georgia in the College Football Playoff championship game. Georgia owned Alabama in a way no opponent had during the Nick Saban era, but only for 30 minutes. While Georgia players gathered on their sideline as halftime came to a close, Alabama remained in its locker room, waiting to return to the field until just seconds remained before kickoff christened the third quarter. What did Saban say? Did he scream, yell, cajole, pray? Only one thing is certain: it worked. Down 13-0 at the half, Alabama scored 26 points in the game’s final two quarters and one frame of overtime to shock Georgia and claim its fifth national title under Saban’s direction. On the sport’s biggest stage, against an opponent built in its own image, Alabama reminded everyone that football is more than a 30-minute game — and in doing so cemented the program’s place as the greatest dynasty to ever exist in college football. It took a series of comebacks. Alabama faced a pair of 13-point deficits, the latest at 20-7. A field goal cut the Bulldogs’ lead to 20-10. Another made it 20-13. Georgia’s next possession would last three plays. Alabama would take the Bulldogs’ punt and drive 66 yards to make it 20-20 with 3:49 left. 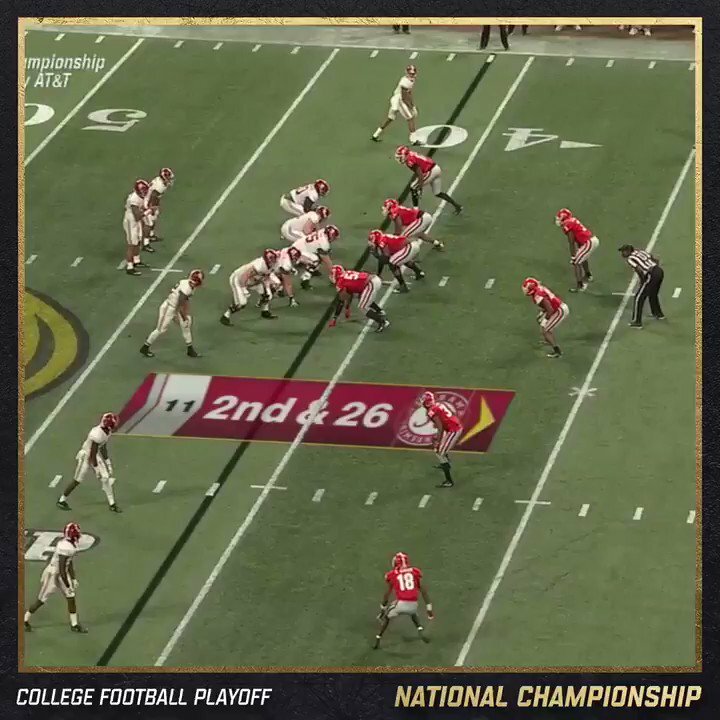 A missed Alabama field goal as time expired sent the game to overtime, where the Tide would follow Georgia’s 51-yard field goal on the opening possession with one of the most memorable moments in the sport’s history: True freshman Tua Tagovailoa found DeVonta Smith for a 41-yard score one play after taking a 16-yard sack. Alabama refused to lose. What a game. What a finish. Alabama does what Alabama does. So Georgia owned the first half; Alabama owned the rest. It demanded one of the gutsiest coaching decisions you’ll ever see in a big-game setting. With the offense listless and lagging under the direction of starting quarterback Jalen Hurts, Saban pulled the plug at halftime and turned to Tagovailoa, who breathed life into a moribund Alabama sideline. Tagovailoa’s performance as a rookie — one who played mostly garbage time during the regular season — will earn a spot in Alabama history. The Tide simply would not be denied. Don’t forget that the highest level of college football can be split into two groups: Alabama, and then everyone else. Twenty minutes separated the Bulldogs from the program’s first national championship since 1980. Jake Fromm’s touchdown pass to Mecole Hardman made it 20-7 with less than seven minutes left in the third quarter, pushing Georgia into a significant lead and putting Alabama in a bind. Then came the Tide. The Bulldogs can only think about how close they came to a title only to throw it away — few teams in college football history can relate. Georgia might point to a pair of botched calls by the Big Ten Conference officials. The first was a dubious offside penalty docked against the Bulldogs on a punt block, one that if ignored would have given Georgia possession on the doorstep of Alabama’s end zone ahead 13-0. The second came on the ensuing possession, and was a clear miss: Officials simply botched a clear facemask penalty by an Alabama defender. The Tide would cut the lead to 13-7 on the following drive to change the complexion of the game. But those are excuses. The truth? Georgia had Alabama on the ropes. The Bulldogs did to Alabama what no one had done during the Saban era — no one. Georgia could’ve put its foot down and ended Alabama’s chances. But the Bulldogs didn’t get it done. For all the talk of a title being part of Georgia’s unquestioned destiny, it was the Alabama dynasty that carried the day. Even before Monday night, there was the thought that Alabama would open its quarterback spot to an offseason competition between Hurts and Tagovailoa. Hurts won games, sure, but there were warning signs; he was ineffective as a passer, limiting the effectiveness of Alabama’s offense and allowing opponents to key on the Tide’s powerful running game. Tagovailoa changed that. He will be the starter in 2018, barring injury, and Alabama will be better for it. Now, just because he starred in a backup role in the title game isn’t itself a guarantee: Texas quarterback Garrett Gilbert was terrific in reserve in the Longhorns’ title-game loss to Alabama in early 2010, but he never came close to recapturing that performance. Maybe Tagovailoa will be different. But in the span of one half, Alabama went from worried to confident about its situation at quarterback. The Tide found its missing piece. Doing so helped the program claim another national championship. It may also ensure that Alabama remains atop college football in 2018. Saban is known to take gambles, and also to have those gambles pay off. Two years ago, an onside kick against Clemson turned the game in the Tide’s favor. On Monday night, it was a change at quarterback that sparked Alabama’s latest title. There’s a reason he’s the greatest to ever do it.